If you have gallivanted in the realm of romance for any length of time, you are probably familiar with the old colloquialism, “Absence makes the heart grow fonder.” Whether you have been the recipient of this cliche or are guilty of perpetuating it yourself, I’m sure you’ve noticed that this kitschy phrase falls a little short in providing any actual help for those living with a far away love. While absence can make the heart grow fonder, it can also make it grow harder. After dating long distance for over a year, I will attempt to offer here what, I hope, is slightly more beneficial advice for those who likewise are separated from their sweethearts. Embrace the present situation, both its good and bad. If you are doing long distance, it is likely because of a circumstance (a job, attending school, etc.) that is beyond your control. Knowing and accepting that this is the reality of your relationship for now is important to you and your significant other’s peace. Give yourself freedom to acknowledge and talk about the lame aspects of it but also be willing to embrace the positives of the setup. While missing regular weekend dates is hard, being apart also gives you a unique opportunity to get to know one another in a different way than daily interaction does. Communicate, communicate, communicate! When you are unable to see and spend consistent time with your boyfriend or girlfriend, the best thing you can do for each other is to talk. Because your companion won’t see you daily and may not be able to guess what you are thinking and feeling, you have got to talk about these things. Share stories of your daily lives, jokes with your friends and activities you are doing! But also remember to make deeper conversation a priority; if this doesn’t happen organically, be prepared to ask very direct questions about how the other person is feeling or what they are learning or struggling with. This will keep your relationship growing even though you’re far apart. Work on the relationship. Just because you may not see each other every day does not mean the relationship is on hold. Continue to pursue the other person, get to know them, sacrifice for them, do kind and considerate things for them. If you do not give your relationship value and the necessary effort when it is stretched across distance, it will not remain a positive thing. Enjoy the freedom distance creates. Being away from each other typically frees up a lot of time and energy (and, honestly, money) to invest in other things. This doesn’t mean totally ignore that faraway boyfriend/girlfriend. However, make the most of your spare time by hanging out with friends, getting to know new people, exploring your city or (if desperate) catching up on homework. Utilizing the extra time you have for something positive and engaging will make the separation less painful. Also, take the opportunity to surprise each other with visits, mail each other fun presents and have Skype dates. As lame as some of that may sound, these things create shared experiences that will help you and your companion bond and remind the other person you are still intentional about your relationship. Remember it is never forever. The great news about long distance is that it doesn’t last. Even though it might feel endless in the moment, eventually, something changes. Someone moves, a job changes, you get married or… something else happens. Either way, you won’t be trapped in a long distance romance for the rest of your life. 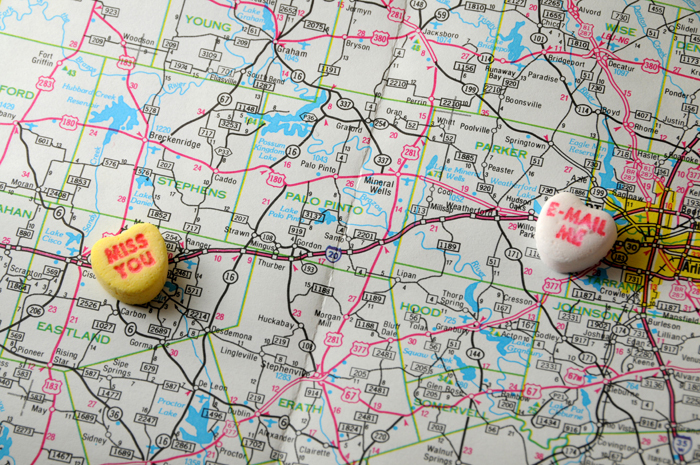 However far apart you find yourself from your significant other, there are definitely ways to help minimize the distance. While long distance dating can be tough, it has some real advantages. Separation tends to slow things down, giving you more time to get to know each other without a lot of pressure. Plus, long distance forces you to become really good communicators, a crucial tool in any relationship’s success. So, if your sweetheart and you are apart, seize the chance to continue growing together, absence and all. Great article Katelyn! From a 5-year veteran of a long distance relationship I couldn’t agree more with the things you had to say. When it comes to “work on the relationship” there are several choices of intentionality that have to be made, but sometime the only way Tim and I got through was God’s strength alone. Thank you for writing this. I would have loved to have read it when I was in my LDR. Thanks, Casey! I should’ve asked you to co-write with me, you two had an even longer experience than me! I appreciate your encouragement.